Predictive Maintenance is one of the leading use cases for the Industrial Internet of Things and Industry 4.0. Our recent analysis suggests that the market for predictive maintenance applications is poised to grow from $2.2B in 2017 to $10.9B by 2022, a 39% annual growth rate. In a nutshell, predictive maintenance strategies are based on the combination of traditional condition monitoring enhanced with analytics algorithms, thus enabling the prediction of machine failures before they occur. IoT and advances in analytics are driving market adoption with users of the technology reporting 25%-30% efficiency gains, according to research. We also analyzed startups, most of which offer software solutions for Predictive Maintenance, including platform and analytics. 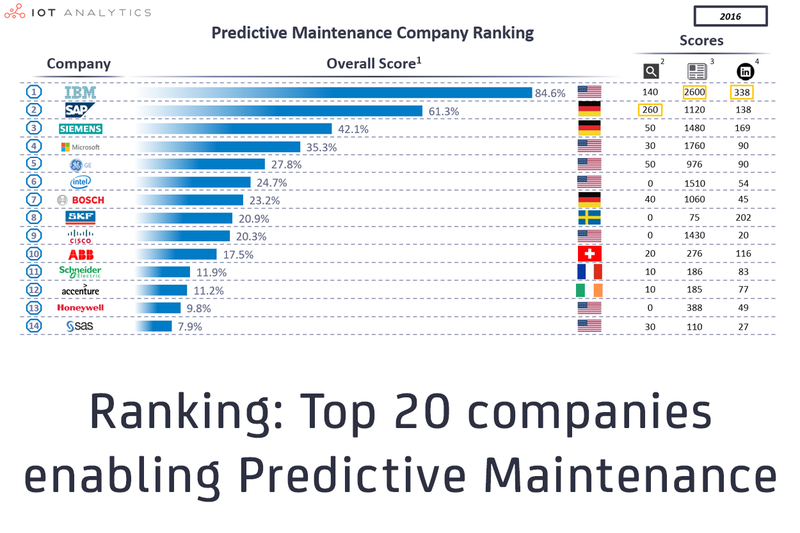 To better understand how active individual companies are in the domain of Predictive Maintenance, we calculated a company ranking for Predictive Maintenance companies – based on the same methodology as the popular IoT Company Ranking and based on data from 2016. Disclaimer: The ranking is an indicator how visibly specific companies present themselves regarding this topic. A correlation between the ranking and the marketing budget is likely. A high ranking does not mean that a company has a good Predictive Maintenance solution nor does it give any indication as to how much revenue the company makes on it. Furthermore, the term “Predictive Maintenance” is often used as a buzzword, not every maintenance solution that is claimed to be predictive actually is, as companies also tend to describe their condition-based solutions as predictive. The ranking favors large firms, is based on specific keywords, and is NOT included in the market report. IBM made #1 in the ranking due to its large workforce that indicates it works on the topic and due to the wide media coverage the firm gets. IBM’s Predictive Maintenance and Quality (PMQ) is one of the key solutions enabled by its “cognitive intelligence engine” IBM Watson. It monitors, analyzes, and reports on equipment data, the output mostly being a health-score. Known examples for Predictive Maintenance implementations are Kone’s elevators or DC Water’s Hydrants. Kone recently launched its 24/7 Connected Services, based on the IBM solution. The German software giant SAP has been showing how it enables Predictive Maintenance for several years now and has thus established itself as the most searched for company in relation to Predictive Maintenance. Notably, it is one of three German firms in the top 10. SAP has implemented its solution “Predictive Maintenance and Service” for customers such as Kaeser Kompressoren or Siemens and the solution is now part of its newly unveiled SAP Leonardo IoT Portfolio. As an industrial automation specialist, Siemens has a different angle on Predictive Maintenance than SAP and IBM. It is often the automation system of choice in factory settings and industrial equipment that Predictive Maintenance is applied to. Therefore, sitting on large amounts of data, the basis for establishing supervised machine learning algorithms is already given. For the implementation of Predictive Maintenance at the NASA Armstrong Flight Center (cooling systems) for example, Siemens worked with analytics services provided by US-based Azima DLI. In a further project, Siemens launched a 12-month Predictive Maintenance pilot with Deutsche Bahn in October 2016 to monitor the fleet of Series 407 ICE 3 trains. Microsoft Azure is establishing itself as the public cloud platform of choice for industrial IoT solutions and Predictive Maintenance. The market report shows that more and more applications of Predictive Maintenance are shifting from on-premise to cloud setups – by 2022 about 70% of Predictive Maintenance setups are expected to be cloud-hosted. Besides the cloud infrastructure, Microsoft Azure currently has two “preconfigured solutions” that are aimed at making it easy for anyone to get started quickly e.g., by providing the necessary analytics engines – they are “Predictive Maintenance” and “Remote Monitoring”. GE has two angles toward Predictive Maintenance: While GE Measurements is established in the condition monitoring hardware field, GE Digital covers the software and analytics part of Predictive Maintenance. GE’s Predix platform is the foundation to Asset Performance Management (APM), which GE itself has claimed to be the first IoT “killer-application”. GE has for example rolled out APM with BPs oil and gas production operations. Furthermore, GE Digital is advancing the concept of digital twin, an important basis to Predictive Maintenance analytics. 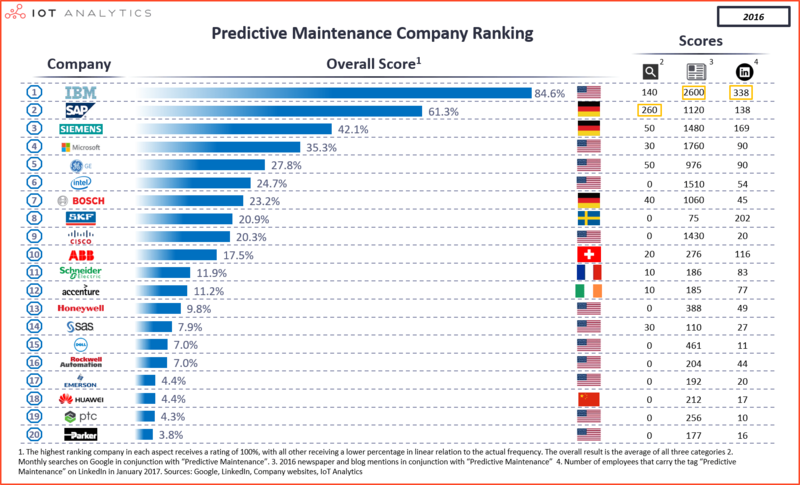 Thomas Siebel’s C3 IoT – originally C3 Energy – is the company with the highest funding of all Predictive Maintenance related startups (more than $110M). The latest funding round remains undisclosed but the initializing valuation was $1.4B. The C3 Predictive Maintenance Solution is built on the C3 IoT technology platform and employs supervised machine learning algorithms for failure prediction. Known customers – mostly from the utilities segment – include the French utilities company Engie and Italy-based Enel. Founded in 2014, the predictive analytics SaaS platform Uptake was named hottest 2015 startup by Forbes and is the fastest US startup to have reached a $2B valuation after only 2.6 years. The company has a total funding of $85M to date. Uptake’s machine learning algorithms analyze data from equipment sensors or even handwritten maintenance records, learning the normal operation patterns and identifying upcoming failure. Well-known customers include Caterpillar and Warren Buffet’s Berkshire Hathaway Energy subsidiaries. SpaceTime Insight currently hold the third highest total funding in the domain ($50M). Like C3 IoT, customers for the Predictive Maintenance analytics solution mostly stem from the utilities field and cover energy distribution and oil & gas. The company acquired IIoT startup GoFactory in June 2016, thereby broadening its spectrum with capabilities in cloud services, connected assets and mobile applications. As equipment OEMs increasingly make their products smart and factories implement PdM solutions, technology providers need to differentiate their offerings. This article covers only a fraction of the companies offering Predictive Maintenance. A range of sophisticated solutions especially by smaller companies remain undiscussed. The 132-page report provides a more complete company landscape of the 110+ companies, in addition to market numbers, trends, M&A analysis, and many more use cases. You can find the report here and request a sample.